Unlock the mysteries of life after death and explore the enlightening discoveries of a private investigator's 15-year investigation. This book is a comprehensive resource answering 150 of the most crucial questions about what happens when we die. Bob Olson is a former skeptic and private investigator who began investigating evidence of life after death after the passing of his father in 1997. This event ignited questions in Bob that he never before considered, so he decided to use his skills as a private eye to investigate the afterlife. Bob has come to be known as the Afterlife Investigator. He is the host of "Afterlife TV with Bob Olson." 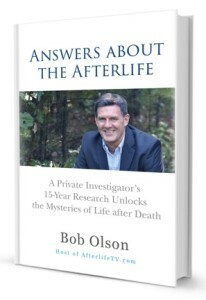 My friend, Bob Olson, has written a wonderful and well-researched guide to the Afterlife. He carefully answers many of the questions and concerns we all have about the other side. The chapter on past lives resonates very much with my own studies of reincarnation and the benefits of past life regressions. I highly recommend "Answers About the Afterlife." ~ BRIAN L. WEISS, MD, author of "Many Lives, Many Masters"
What happens when we die? This is one of humankind's most important and enduring questions. "Answers about the Afterlife" brings a fresh and exciting perspective to this ancient question. Bob Olson presents an impressive compilation of many lines of evidence that converge on the conclusion that the afterlife is, in a word, real. Innumerable common questions about the afterlife are addressed. This book is well written and enthusiastically recommended. ~ JEFFREY LONG, MD, author of the New York Times bestselling "Evidence of the Afterlife: The Science of Near-Death Experiences"
There is a universal question every human being longs to answer: What happens when we die? With the keen and thorough eye of an investigative reporter, Bob Olson takes on this question with a loving heart and full-on determination. Sifting through more than fifteen years of intense and exhaustive research, he's created a spiritual encyclopedia of sorts that provides the reader with answers. This is a brave and compassionate book that will bring comfort and insight to many during the most important times of our lives. ~ CHERYL RICHARDSON, author of "The Art of Extreme Self Care"
~ JAMES VAN PRAAGH, Spiritual Medium & author of "Growing Up In Heaven"
~ ANITA MOORJANI, New York Times Best Selling Author of "Dying To Be Me"
~ JENNY COCKELL, author of "Across Time and Death: A Mother's Search for Her Past Life Children"
What happens when we die? And why is this question so prone to debate? Considering the nature of this subject, and how varied beliefs are about it, it’s hard to imagine anyone addressing it more sincerely - and, inclusively - than Bob Olson does in this book. In a warm, considerate, and remarkably cogent manner, Bob shares his findings, based on over fifteen years of research using techniques gleaned in his work as a private investigator. If you can read this book with an open mind, it will go a long way to quell any fears you have about death, or any doubts you have about the existence of an afterlife. Whether you’re grieving a loss, seeking answers to bigger questions, or supporting a loved one in their final stages of life, this book, unlike any other, will provide hope and peace of mind. ~ DAVE KANE, author of "41 Signs of Hope"
Bob Olson's new book, "Answers About The Afterlife," is an excellent read. Like his interviews on Afterlifetv.com, Bob's book is genuine and engaging. He presents his ideas and conclusions with an organic logic, making potentially challenging concepts simple to digest. Answers About The Afterlife stretches beyond belief systems respectfully, eliminating competition and resistance, setting the reader's own curiosity free. Bob's work is a true inspiration to keep asking the questions that matter. ~ NATALIE SUDMAN, author of "Application of Impossible Things: A Near Death Experience in Iraq"